DublinTown is a Business Improvement District in Dublin City Centre. BIDs improve the trading performance within specific geographic locations by improving the commercial environment and proactively marketing the district. Legislation for Dublin City BID, the first BID in Ireland, was passed in 2006. The proposed plan for the area was endorsed in November 2007 and operations began in March 2008. The BID operates under a 5 year mandate to develop and promote the economic advancement of Dublin city centre and was renewed for another 5 year term in 2012 (by a margin of 1063 for versus 511 against). The current BID term is from 1st January 2013 to 31st December 2017. Our goal is to position Dublin city centre as the location of choice for shopping, leisure and business. Dublin City BID works on behalf of the 2,500 businesses in the area to create an attractive, welcoming, vibrant and economic successful space for Dublin city. As a member of DublinTown can I put forward ideas to be included in the We Are DublinTown plan? We host regular area meetings for our members, please keep an eye out for upcoming meeting dates this year. Area Meetings take place quarterly with dedicated meeting for each district – Creative Quarter, Dublin One, Dame District, Grafton Quarter and Talbot District. How do I participate in Dublin Town programmes & promotions? Remember to keep an eye on our weekly newsletters and other emails or follow and engage with us through social media on Twitter, Facebook and Instragram. How does an area become a Business Improvement District? Businesses will identify the area and the issues affecting it and put together a proposal which should include delivery guarantees, performance indicators and management structure. Business Improvement District proposals are voted on by the non-domestic rate payers who will be responsible for paying the BID levy. Businesses must vote in favour of becoming a Business Improvement District in order for it to be established. The vote is carried out via postal ballot conducted by the local authority. A Business Improvement District’s mandate is for a maximum of 5 years. A Business Improvement District wishing to continue beyond 5 years must reaffirm their mandate through another ballot, based on a further proposal. Can I view DublinTown’s financial statements and annual reports ? Members can view yearly financial statements below. What do I receive in return for my levy? DublinTown’s members benefit from a range of services across the three core areas of focus as agreed in our mandate. The primary objective is to increase the number of customers coming into the city. We aim to achieve this by (1) creating a welcoming city (2) ensuring a sense of security in our city and (3) implementing a marketing campaign that promotes the city centre as the destination of choice for work, shopping and leisure. We provide supplementary street cleaning throughout the DublinTown area, including a rapid response service and we remove between 18,000m2 – 20,000m2 of graffiti from our members’ buildings each year. Our team of 12 Visitor Assistants and our four Information Kiosks provide information to approximately 300,000 visitors and Dubliners alike per year. We also provide Christmas lights throughout the city, flower planters and hanging baskets on streets in our area. Our members benefit from being part of a wider collective economic voice of 2,500 businesses when DublinTown represents their interests on issues facing the city centre. Through active lobbying and petitioning we ensure our members’ voices are heard. This collective economic muscle also allows us negotiate preferential rates on products and services for our members. For example, the DublinTown insurance scheme offers members savings of up to 20% on their insurance premia. The scheme also reinvests a proportion of the fund back in our area for further development and promotion. DublinTown also provide Christmas Lights to almost thirty streets around the city centre. 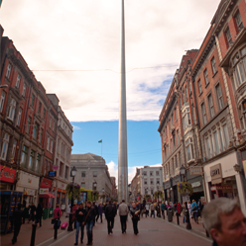 As agreed in the original ballot voted in by the majority of businesses in the DublinTown area, DublinTown is funded by its members. Each member pays a levy which in turn is pooled and used to fund the range of schemes and projects that DublinTown organises on behalf of its members. The levy is based upon 4% of the rateable valuation of the property. Why are Business Improvement Districts required? Business Improvement Districts support the long-term sustainability of town and city centres. This support is needed because town and city centres have been under increasing pressure since the development of out of town shopping centres and the over-provision of retail space in suburbs as well as changes in shopping habits with the rapid rise of online retail and mobile commerce. Business Improvement Districts enable town and city centres to approach the management of the trading environment / public space in a proactive and planned way which allows them gain and retain competitive advantage over the managed environment of shopping centres. Business Improvement Districts provide funding for the functions of town centre management, e.g. cleaning, marketing, Christmas lights, and ensure that everyone who benefits from these services share the cost. They also provide equality in ensuring that everyone who benefits shares the cost. Business Improvement Districts are about joined-up thinking. The collective voice of a specific area is louder than several small voices. By bringing businesses within the area together, we can represent the needs of the city centre. Can businesses opt out of DublinTown? All businesses situated within the DublinTown area are automatically members of the DublinTown as a result of the vote taken in 2007. The Business Improvement District scheme was renewed by ballot again in 2012. The result of this ballot was 1063 votes in favour of renewing the scheme versus 511 against which has given us a strong mandate from the city’s business community to continue our work up to 31 December 2017. A further ballot will take place in 2017 to renew the BID until 2022. Can businesses opt in to become a members of DublinTown? Businesses outside the agreed area of the DublinTown cannot choose to become members of the scheme. Our membership and the range of services that we offer are limited to the defined geographical area of the DublinTown. What area does DublinTown cover? The DublinTown area spans approximately 2.5km, running from Stephens Green to Parnell Square and from Capel Street to Amiens Street on the northside of the city and Dawson Street to South Great Georges Street on the southside of the city. The area is made up of 115 streets just under 4,000 buildings and 2,500 members. We have 2,500 members across the core of Dublin city centre. Our members include every retailer, restaurant, hotel and service providers in the defined BID area. All rate paying businesses within the BID area are automatically members of the organisation. What is a BID or Business Improvement District? A BID or Business Improvement District is a business-led and business-funded body formed to improve a defined commercial geographic area. The concept of BIDS (Business Improvement District Schemes) originated in North America in the 1970s and they have been in existence in the UK since 2003 as a proven mechanism for effective town centre management. BIDS are formed following consultation with businesses in a defined area. After this process a ballot takes place in which businesses vote on a proposal or business plan for their area based on the developmental requirements of the area as well as the needs and wants of the businesses contained within it. DublinTown as a Business Improvement District is subject to renewal every five years and the next renewal ballot will take place in 2017. The support from members is dependent on our continuing to meet member’s needs. If members are not satisfied with the services offered and the value for money represented by the organisation then we would like to hear from you. If members are not happy with the delivery of DublinTown services they should take it up in the first instance with the CEO (Richard Guiney, email: richard@dublintown.ie). If they are not satisfied with the response from the CEO they can raise the matter with the Executive Subcommittee of the Board vie the chairman@dublintown.ie email address.